SUMMARY: The Citrus Research Board Canine Project Manager provides important support to the CRB for follow-through and implementation of a strategic plan developed by citrus HLB diagnostic stakeholders to transition canines for use and commercialization in California. Problem-solving, communications, writing, priority setting, time management and business development skills are necessary. The Citrus Research Program(a.k.a. Citrus Research Board) is a grower-funded and grower-directed program established in 1968 under the California Marketing Act as a mechanism for enabling the California citrus growers to sponsor and support needed scientific and technical research to further the goals of the California citrus industry. The program is administered by the Citrus Research Board, which is commonly referred to as the CRB. Serve as the lead support staff for the implementation of the strategic plan described in the summary above. Work as a liaison with the detector canine owners (USDA-APHIS), trainers (F1 K9), researchers and California citrus HLB diagnostic stakeholders (CRB, Citrus Pest & Disease Prevention Program/Committee, California Citrus Mutual and others) to communicate progress in implementation of the plan. Serve as a member of the CRB staff, unless established and designated as an independent contractor. Under the direction of the President and/or the Chief Research Scientist, write “white papers”, reports, concept documents and other canine detector-related documents. Provide staff and organizational assistance to the HLB Detector Canine Transition Team. This involves working with representatives of the various stakeholder groups, researchers, government officials and others. Draft transition team meeting notices and agendas. Prepare and submit minutes in a timely, correct and professional manner. Provide vision, ownership, accountability and leadership for project management. Details include involvement in strategic planning, follow-through on the subsequent strategic plan, reporting to the CRB and other stakeholder groups, negotiating contract terms with vendors and commercialization of the canine detector teams. Perform other duties as assigned by the Chief Research Scientist and/or the President. Clear, effective written and oral communication. Self-starter and can-do spirit with pride in the outcome of the final project. Leadership, thoroughness, accuracy, objectivity and integrity. Knowledge, experience and ability to relate the science of HLB detector canines to the citrus industry and the public in order to establish their credibility and gain confidence in them as an early detection technology. Ethical conduct and the ability to exercise confidentiality. Ability to create, organize and publish data. Ability to meet deadlines and organizational goals. B.A. or B.S. in a relevant science field is required. PhD preferred. Industry experience in science communication, entrepreneurial commercialization, and/or research project management may be substituted. Solid experience and knowledge of Microsoft Outlook, Word, DropBox, Office 365, PowerPoint and Excel is strongly advised. Must have legal authorization to work in the U. S.
Possession of a valid California Driver's License and clean driving record. Frequent out-of-town, multi-day business trips will be necessary. Preparing and delivering oral presentations and written progress reports. Ability to work both independently and in group settings for problem-solving, coordination and collaboration. Competent use of standard office equipment such as computers, scanners, database management software, telephones and photocopiers. Lifting of boxes and other field materials weighing up to 35 pounds. 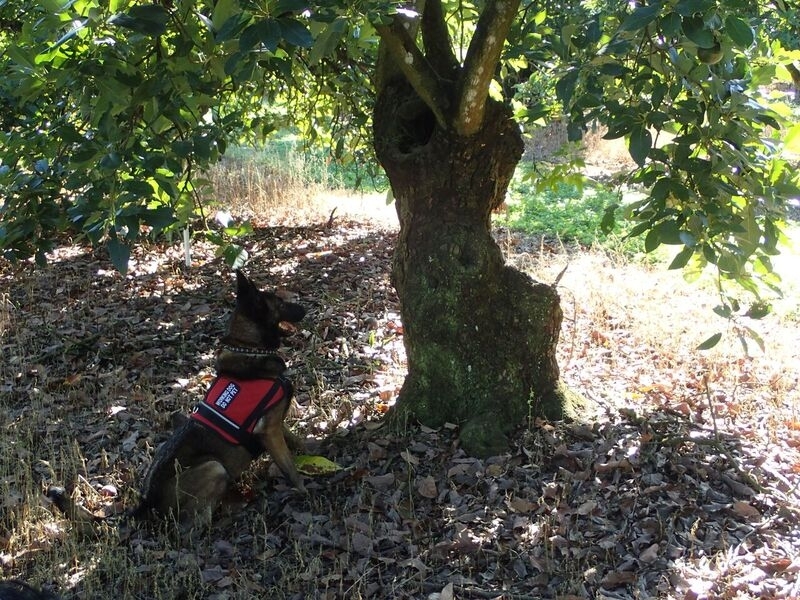 Ability to spend significant time in citrus orchards and training facilities, including the observation of canine detector teams during extended periods of heat and cold. The Citrus Research Board is an equal employment opportunity employer without regard to race, color, national origin, gender, age, marital status, religion, disability, sexual orientation, pregnancy, or veteran status or other characteristics protected by the law. Also a great article on dog-sniffing bee hives for foul brood. Go DOGS! 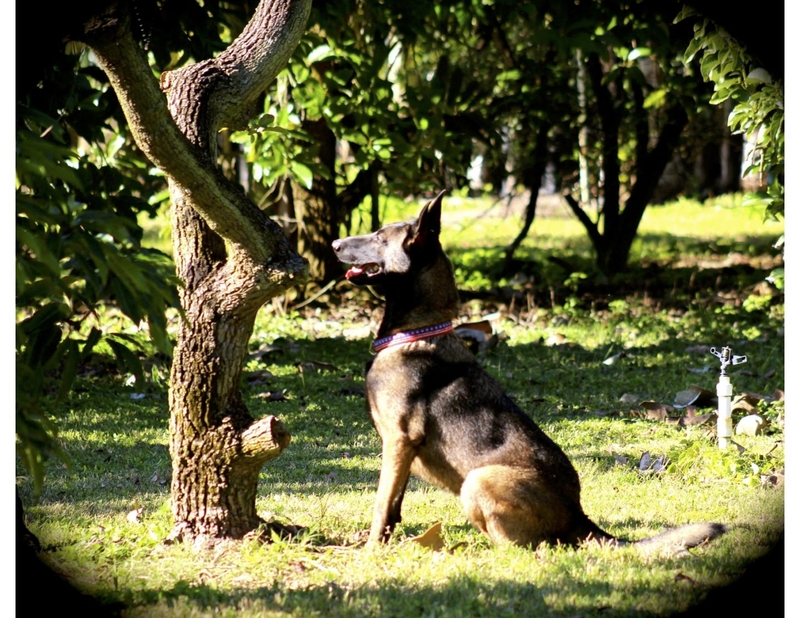 Cobra, a 3-year-old Belgian Malinois, is trained to detect laurel wilt-diseased trees before the visible symptoms are seen. She and two other Dutch Shepherd canines detect asymptomatic, but infected trees. Once a diseased tree is identified, these "agri-dogs" will sit, indicating a positive alert. On a recent trip to Florida we saw a dog in action locating avocado trees that had been attacked by the Redbay ambrosia beetle which carries the fungus Raffalea lauricola which is a similar pest/disease complex that is found in California with the Polyphagous/Kuroshio Shot Hole Borer and Fusarium Euwallacea that leads to Fusasrium Wilt in avocado. 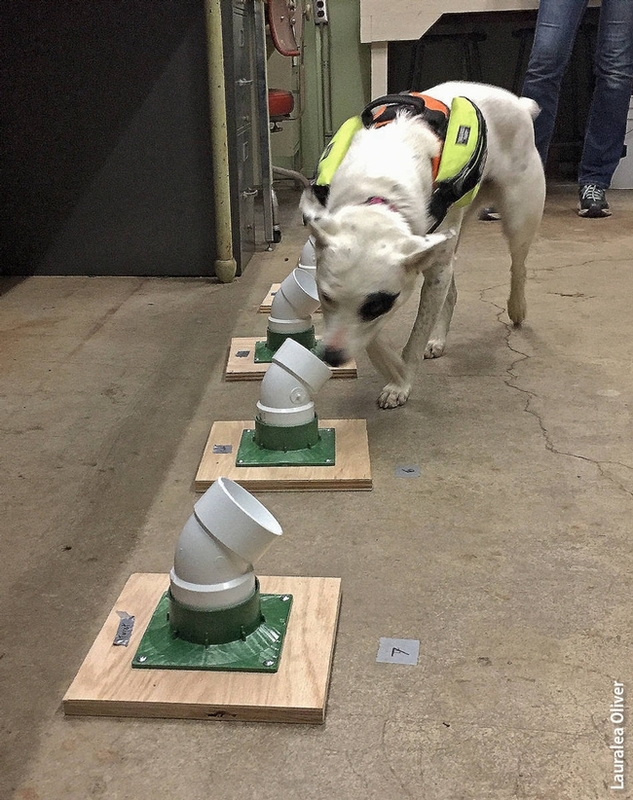 The fungus gives off a certain odor that the dog is trained to smell and along with the human trainer goes around the orchard to identify infected trees. The trees can then be removed so that they don't act as a reservoir of infection that can be spread to other trees by the beetle. The dog seemed to work pretty fast. Depending on the acreage covered, the handler says they charge $150 per acre to find diseased trees. This can happen before more advanced symptoms show up that humans can see. This technology could be used in identifying other tree diseases, such as Huanglongbing, citrus canker and Phytophthora, along with others. Dog has found a laurel wilt infected tree that will soon be removed. (Tim Spann).